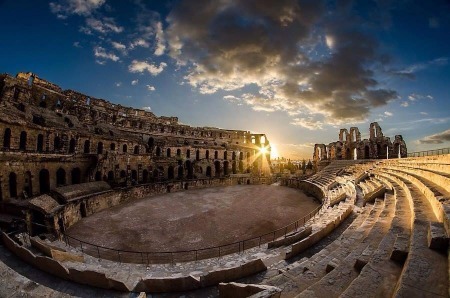 A must whilst in Tunisia: the finest example that can be seen in proof to the grandeur of the Roman Empire in North Africa at El Jem and its amphitheatre and the beauty of the Islamic architecture and its simplicity in Ifriquia, Tunisia. The first Muslim city built by Arab Muslims in the mid 7th century and known for the great mosque, the mausoleum of Sidi Essahib, the Aghalabitan water reservoirs, the Medina, the best carpets weavers, the Makroudh cakes from semolina and date paste and famous for being the city of the 100 mosques. The most imposing Roman monument tracing back to the 3rd century still standing in North Africa. The 3rd largest amphitheatre in the world and the most preserved one to the point that it’s still in use today for the international festival of classical music and symphonies.